The function of Network Address Translation (NAT) is to translation a private IP address to into a public IP address that connected to the internet before packets are forwarded to another network and vice versa. NAT can advertise a single public IP address for the entire local private network to the internet and providing a security by hiding the entire internal network behind that address. In this article, we will configure different configuration of static NAT or Server NAT and Dynamic NAT on Huawei firewall model USG6000. a. You have already install Huawei eNSP on your computer. If you do not, you can refer to this link Huawei Network Device Simulation With eNSP. b. You know how to configure SSH remote management on Huawei router. If you do not, you can refer this link SSH Configuration on Huawei Router AR2220. 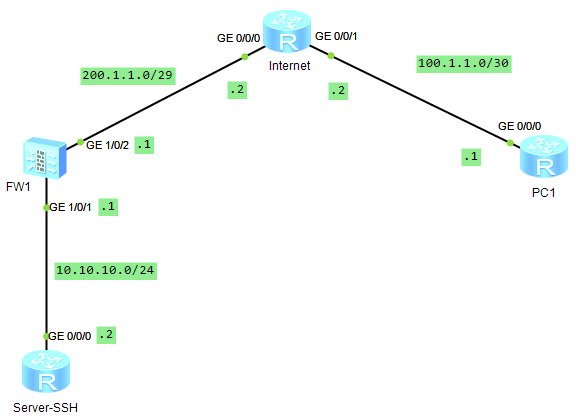 We will set up a Lab to configure NAT as show in the following diagram. We will configure NAT on “FW1”. There is one router in the LAN with the host name as “Server-SSH” and this host is acting as an inside LAN server. We will configure SSH server on this host. There is one router act as the internet and another router act as computer in the public network. The following is the basic configuration of each devices. First all, we can configure host name and IP as the following. Then, let’s configure SSH server fore remote management as the following. On FW1 let’s configure the basic configuration as the following. Add interface Gi1/0/1 to the trust zone and interface Gi1/0/2 to the untrust zone. Configure the firewall rules to allow traffic as the following. We just need to configure IP address on each interface on the Internet router. On PC router, let’s configure the basic configuration as the following. Before we configure dynamic NAT, HQ-RT01 is not able to ping to IP address of the internet router. Now let start to configure dynamic NAT on FW1. First, we need to create a network object to contain the IP address to be NATed. In below object, we allow only IP 10.10.10.2 in the LAN can access to the internet. Then, we need to configure dynamic NAT on the NAT policy configuration using interface g1/0/2 as egress interface that connect direct to the internet and using the created object above. Now, Server-SSH should be able to ping to IP address on the internet. It is also possible if we want to translate our LAN IP subnet to pool of public IP address. In the following command will create a NAT pool with IP address rang from 200.1.1.3 to 200.1.1.4. Then on NAT policy configuration, we need delete the old rule and add the new rule as the following. Then, we can test ping to internet again from Server-SSH. If we want to publish the access of the internal server to the internet, we can configure static NAT on our firewall “FW1”. In the following command will configure a static NAT for remote SSH access from the internet using the IP address that is assigned to interface GE1/0/2 of FW1. Now, if we test telnet port 22 to the public IP configure on interface GE1/0/2 of firewall FW1 from router PC, we should get the following successful result. To login to Server-SSH from the internet, we can use the following commands. Usually, there are many local services to publish to be accessible from the internet. In this case, we can configure NAT the local IP to any available public IP within the same subnet of IP that assigned to the Huawei firewall “FW1” interface GE1/0/2 which it is connect directly to the internet. To so, first we need delete the NAT configure above. we can configure NAT as the following to NAT public IP 200.1.1.5 port 22 to the private IP 10.10.10.2 port 22. We can test telnet from PC1 router as the following. Now we can test SSH from PC1 router, we should get the following result. That’s all about configuring network address translation (NAT) on Huawei firewall model USG6000 from Tech Space KH. Hopefully, you can find this guide informative. If you have any questions or suggestions you can always leave your comments below. I will try all of my best to review and reply them.